Smart businesses are always looking for good ways of advertising whenever they have the opportunity by any and all methods that are effective, useful for growing business, and spreading the company name. Advertising is so very important to a business’s health and growth, but that importance magnifies during harsh economic times. Sadly, one of the first areas many companies “cut back” in is advertising, which compounds their budget short-falls. What businesses need is a solution that provides an effective advertising medium, while at the same time being one that won’t “break the bank”. Businesses are finding that the solution to this problem is to use an inflatable tube dancer. 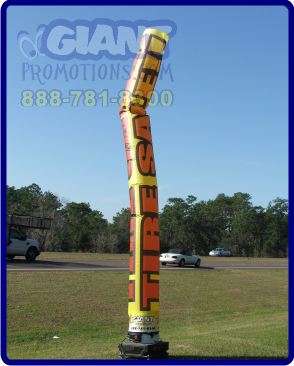 These are inflatable outdoor advertising promotions that are made out of a nylon or polyester material sewed into the shape of a tube (hence, the name). These long tubes, which can be made into almost any height, often have faces printed or painted at the top end (the end blowing in the sky), with the bottom end attached to a high-powered blower. As the sleeve inflates and then blows up the entire length of the sleeve, the air exiting through the end of the tube causes the inflatable tube dancers to flail around in every direction. The “man” will stoop every now and then towards the ground, which causes the tube to bend over, creating a definite space for the fan blower to fill, making the man rigid which allows him to stand back up. This only releases the pent up air which causes inflatable tube dancers to fall and flail about again. It is a process that can be hard to envision, and simply needs to be experienced. But the point of it all is to draw attention, and in the end, it accomplishes that goal. Movement is attention-getting, particularly when the inflatable tubes are made out of fabric in bright colors or patters. Besides the faces which are often painted on the top, as mentioned, some of these inflatable tube dancers also have smaller “arms” sewn towards the top. This gives the illusion of the bottom half of the tube being “legs” which is where the name “tube man” or “fly guy” came from. Other tube dancers have no face or arms and are printed with simple words such as an event (like “sale” or “grand opening”), or a product (such as “cars” or “computers”). Because of the flailing motion of this type of advertisement, the words printed on the sides of the tubes can be difficult to read. So if printing words is a must, its very important to keep it simple to give those driving or walking by a chance at reading what your dancing sign has to say. The movement provided by the powered air blower, causing these bright inflatable tube dancers to move in unpredictable ways results in a fun, colorful, “living” advertisement. It turns heads and shows people where a business is located and that the business is open. And the painted, smiling face with waving arms is a great way to extend a welcome to new customers.